Here’s the thing. I love classic Hollywood musicals of the Ginger Rogers - Fred Astaire variety and I love classic tragic Hollywood romances like Casablanca. I even love jazz - and not the smooth jazz muzak that this movie decries but actual jazz. I also thought that Damian Chazelle’s WHIPLASH was by far the best movie I watched in 2015. I was one of the people in the Odeon Leicester Square who gave it a ten minute standing ovation at last year’s London Film Festival and then bounced into the afterparty in a wave of energy inspired by its audacious premise, breakneck pace, astounding acting and cinematography. So to say that I was looking forward to his next feature, LA LA LAND, was an understatement. As we entered the festival, LA LA LAND rolled into town on the adulation and plaudits received at Toronto and Festival Director Claire Stewart announced to the audience that this was the “hot ticket” of the festival. But, dear reader, I hated LA LA LAND from its opening moments, and while my feelings toward it softened through its two hour run-time, I feel it is a deeply flawed, over-ambitious, uncontrolled, mis-conceived film. I am calling The Emperor’s New Clothes on the critical acclaim. At heart this is a simple romantic drama about two people who should fall in love, resist it, then let their careers get in the way of it, and will always regret it - along the lines of cinematic greats such as THE WAY WE WERE or CASABLANCA. He’s a purist jazz pianist who sells out to make the money to buy the kind of jazz club he thinks can save jazz. She’s an aspiring actress who backs herself to write a one-woman show that will launch her into stardom. Along the way she gets tired of his touring and he gets tired of her perceived demands on him to be financially successful. But they’ll always have the Griffith Observatory. Where Chazelle does well is in documenting the petty slights of auditioning in a heartless town, and the invidious financial pressures artists face, and the choices that can cost you your integrity. And so, within this baggy two hour musical, there’s a first-rate ninety minute drama waiting to be liberated by the editors. After all, Ryan Gosling (DRIVER) and Emma Stone (BIRDMAN) are both excellent actors, and bring the goods in the conventional acting scenes. There’s a central and pivotal moment where he cooks her dinner and you realise the relationship is not going to survive that is a tour de force. But that superb (if conventional) 90 minute drama is wrapped up in an attempt at a homage/pastiche of Hollywood musicals. Here’s the problem with it. The songs aren’t strong enough. There’s basically one decent number here, and you can’t spin jazz variations on it for two hours. The lyrics are uninspired with none of the lyrical versatility and wit of the classic musicals. Moreover, Chazelle has chosen to cast big name actors - no doubt to sell the drama both emotionally and financially - but neither of them can sing or dance. The excuses I hear are that - well, this is meant to be naturalistic! But no, if you are trying to sell as a proper respectful love song to the Hollywood tradition you have to pay it the respect of casting people who can actually do the goods. The same is true of Gosling’s piano playing, which is not on a level with Teller’s ability to play drums in WHIPLASH. But the bigger problem is a lack of control or a lack of obvious purpose to the visual experimentation. The over-riding sensation I had watching WHIPLASH was that here was a director in total control of his production. He knew exactly the effects and impact he wanted to achieve - was going to use unconventional style to get it - and had succeeded in spades. 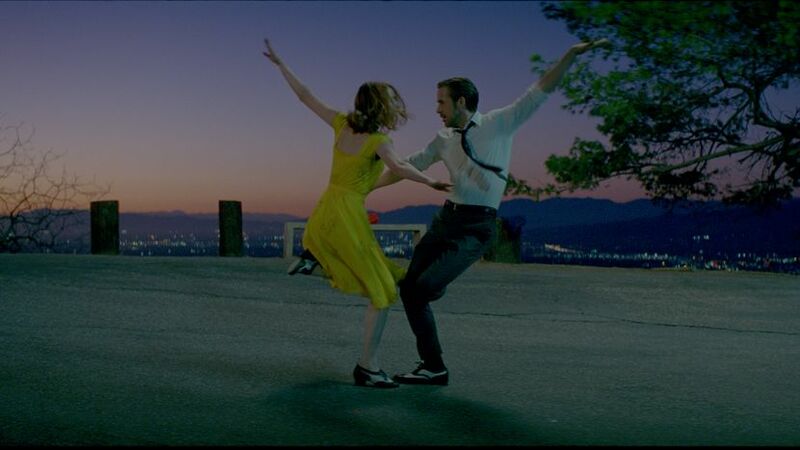 By contrast, LA LA LAND felt like a series of stitched together visual moments - let’s have them dance on air here! - let’s have them step into a white background classic music backdrop - let’s just fast forward through an alternate future - but none of it had emotional or narrative coherence and drive. It’s as though Chazelle - on the back of the success of WHIPLASH - was given access to the full candy store and randomly put his hands in a bunch of different tins and pulled out a too clashing, too sweet, too over-done set of dance numbers. So, for all the brilliance of individual dramatic moments, LA LA LAND is simply NOT COHERENT as a movie. It does not have the quality of songs or performances to qualify as a musical of note. In short, I would much rather have spent my time rewatching WHIPLASH, REBEL WITHOUT A CAUSE or CASABLANCA. In the words of Flavor Flav, don’t believe the hype. LA LA LAND has a running time of 130 minutes and is rated PG-13. LA LA LAND played Venice, London and Toronto 2016 and will be released in Belgium on November 30th, Singapore on December 1st, Sweden and the USA on December 2nd, Germany, Croatia, Canada and Estonia on December 16th, in Argentina and the Netherlands on December 22nd, in Poland on January 6th, in the UK on January 13th and in Chile on January 19th.